It is essential to keep up with the organizations currently funding bladder cancer research around the globe. 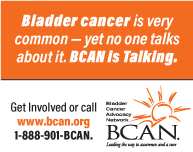 For this reason, BLC is investigating ways to offer its community data on bladder cancer funding. One option is to visit the Dimensions website (dimensions.ai) where users can search for grants, patents, clinical trials and policy documents through a free app. We invite you to get in touch if you have further suggestions.